ISRAEL 2018: He was selling home grown pickled olives with the seeds already removed. Like many of the vendors, this salesmen had a charismatic attitude and all but insisted you try a sample of his products. The next step included bargaining for the right price, something that many, I not all vendors expect and invite. I think many enjoy that aspect of Israel. Plus, the customer feels as if they are leaving with a deal. Druze farmers in the valley grow everything from apples to cherries, most using century old techniques. The area is of high elevation which apparently helps to give a righteous crop. In Israel, the Druze (الدروز الإسرائيليون ) are a minority. 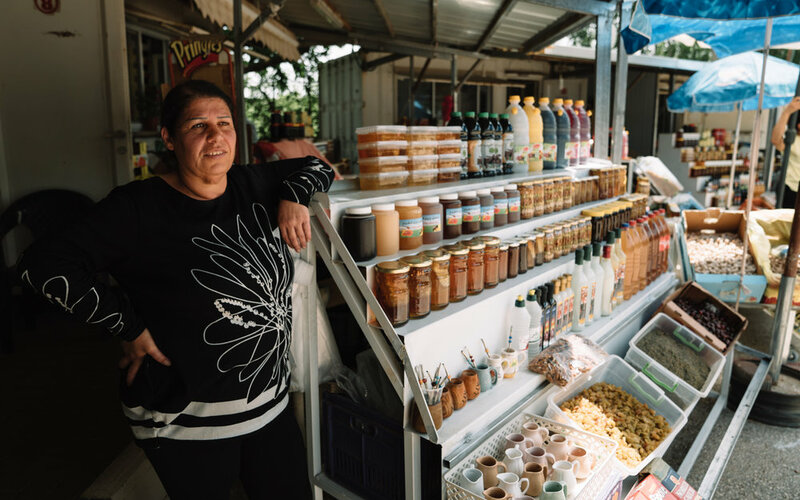 Agriculture is huge for the Druze, which explains why the majority live a humble lifestyle in more rural settings as opposed to the faster paced cities of Israel. While the Druze religion derived from Ismaili Islam, they are not usually referred to as being Muslim. At the same time, they are recognized by the government and do serve in the Israel Defense Forces. Prior to the Druze attaining a status of sorts, they were discriminated against by the judicial system. In 1957, the Israeli Government approved an ethnic community for the followers of Druze. Golan Heights was one of the approved areas. This photo was shot in the area of a large crater made lake in Northeastern Golan Heights near Mount Herman. In Hebrew it is called “Brekhat Ram,” meaning high pool. Geologist believe the lake was formed inside an extinct volcano. Golan Heights consists of 690 square miles in size and is bordered by the Sea of Galilee and Hula Valley along with Mount Herman.